What he does: I am a photographer and a filmmaker. One of my older sisters gave me a old analog camera in 1997 just before I travel to Torres del Paine. I bought diapositives and colour films. After the trip I realized that the photos were not very good. I doubted of myself until a Chilean photographer told me, “You must take more photos in your life.” This expression was revealing for me. In general I imagine the photos in a particular place. Obviously, it is never the same when you are shooting there, so I try to bring that first picture to that moment. Another habit is to look through the viewfinder and wait for the exactly moment. I prefer to shoot in film so the moment you are capturing is unique. The sound of sea, or the sound of fire. For me it is the same. When you dont have any, you can climb to the top of a high building where the sound of traffic is in some way similar. I believe in everything. When I was Younger, I used to be Catholic, for my education and my family, but today I believe in God, Buda, Aliens, other galaxies, mermaids, and much more. The fall of the current economic system and the change to a more sustainable world. Think less and enjoy more. I am now reading a book, given to me by a friend, called Homeostasis. There are several interviews, with all kinds of people—conducted by Sergio Larraín, a Chilean photographer—who live in Chile and have changed their lives after living in the “system.” It is a book in which people analyze the current world, and the world they imagine for future generations. Michel Haneke (director and screenwriter), Emmanuel Lubezky (Cinematographer). Richard Hawley and Neil Young are always in my headphones. John Hilliard, Manuel Álvarez Bravo, Constant, Harold Feistein, and Vivian Maier. 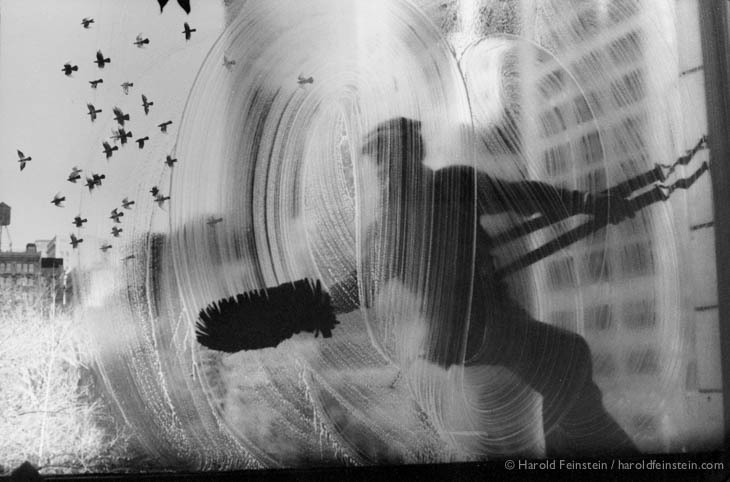 There is a photo from Harold Feistein (“Window Washer,” 1968) It’s the shadow of a man cleaning a big window and behind, a herd of birds fly. Is a magical moment. I dont´know. Maybe because I’m obsessed with memory. Stay during a long time with a native tribe.